Gyms tend to go through really great seasons and not so great seasons. Fluctuating membership can mean strains on your finances. The best way to continuously build awareness for your gym is through marketing and advertising strategies that not only bring in new customers but also remind current customers why your gym is the best one there is in the community. Learn how to acquire more monthly customers and subscribers for your gym and fitness company. Searching for help with your marketing and website development for your gym and fitness centers? Gyms and fitness centers tend to go through great seasons and not so great seasons. Fluctuating membership can mean strains on your finances. It might feel like you’re always seeking out new customers to fill in memberships from those that chose to end their membership with you. The best way to continuously build awareness for your gym is through marketing and advertising strategies that not only bring in new customers but also remind current customers why your gym is the best one there is in the community. An integrated and cohesive marketing plan includes tactics and strategies for how to use each channel to its full advantage to excite and delight both customers and prospects with what you have to offer. As you prepare your marketing plan, this guide will help you in the following areas. Let’s dive in deeper to each of these aspects of your gym marketing and advertising plan. Special events: special events, such as competitions, can bring people into your gym who wouldn’t experience it otherwise. This gives you something to talk about on your website, social media and print ads. Classes: some people really hate feeling like a hamster on a wheel walking or running on a treadmill. Others want to build muscle but don’t know how on their own. Figure out who your main demographic is and design group fitness classes for them. You can then use these classes to draw in new members. Kids club or programming: one of the most significant barriers for parents being able to get a workout in is what to do with their little ones. If you can create a kids club program where there’s a safe place for children to play with supervision, you can bring in more people this way. Then, as the children get older, have fitness classes or education tailored to them so that parents can feel good about making the gym a family outing. Partnerships with local businesses: many businesses now offer a partnership with a local gym to promote wellness for employees. Wellness programs can help businesses receive lower health insurance premiums and have employees that take fewer sick days each year. Unique fitness equipment: maybe it's a hot new machine, like Peloton or the latest weight lifting equipment, but whatever you choose to invest in, allow it to be something that makes you unique. This can be a market differentiator for you. Design customer membership options: let’s say you have a pool. You might offer a pool only membership for athletes just looking to get in some exercise time there or train for a competition. Other membership options might be weekends only since many larger businesses now offer on-site gyms Monday through Friday. Family memberships can help make a gym more affordable for parents with children. Another option is to do memberships with or without access to your group fitness classes as those might appeal to some while others might prefer to save the money. One-day or multi-day passes are great for those on the go. For example, if you're located near a convention center or have other short-term traffic to your area, create a weekly pass to invite in visitors to the area. Once you know what programming to offer to create your market differentiators, you’re ready to start promoting these through your marketing and advertising efforts. Here’s how to use each marketing channel to your advantage. Search engine optimization is pivotal to your marketing and advertising strategy. Even more important than general SEO is local SEO for gyms. Let’s take a closer look at each one of these tactics to map out a plan for each. Google My Business enables you to have a listing for your gym on the search engine. Your gym shows up on a map with your hours and contact information at the top of search results. Even if you aren’t number one on the search engine page for your website, you can appear on this map with good placement to draw in new customers. It's simple to claim your listing and all you need to do to verify it is receive a postcard to your listed address with a unique code that you input on Google. Once complete, you'll sit right alongside your competitors on the search engine. To be able to connect your gym's mentions across multiple websites and platforms, search engines need it to be consistent. Search engines are really smart and can make a lot of connections, but they still need a little help. How your list your gym name and contact information does matter so keep it consistent. Have a document where you list out how you’ll post your contact information so that it’s consistent. For example, decide if you want to spell out or abbreviate “road” and your state name. It may seem small, but these do matter. Reviews help your business stand out on Google when placed next to your competitors. Other than your proximity to potential customers, there’s not a whole lot more than can help you stand out. Reviews show searchers that you are a good choice and can tell them why. It also lends another voice to the conversation so that you’re not always just promoting what you think is great about yourself. Links to your website from other websites are like a referral for search engines saying “you can trust this guy.” You want the links to your site to be from trusted and reputable websites. Back in the early days of search engines, people thought that all backlinks were good and helpful. That isn't the case anymore, so you need to make sure it makes sense to have links to your website. Think about sponsoring a local sporting event, such as a fitness expo or run. Be sure that you’ll get a website listing out of the sponsorship though before you commit. Also look for other community opportunities for links wherever you can, such as guest blogging for other businesses, like a health care practice looking to promote wellness through exercise. Ultimately, your full online presence leads back to your website. That means that your website needs to be easily navigable and present useful information to help a prospective customer choose you. You want to list your address prominently on your website to add to your local search strategy. If you’re trying to rank for gyms with a pool or with a Zumba class, make sure that you’ve optimized your website for those keywords too. Social media is where you can have a lot of fun and show a bit more of your personality so people can get to know what makes your gym unique. Each social media platform has its strengths. Let’s take a look at how to use each one. Instagram is known for being a great place for fitness enthusiasts. There are many influencers on Instagram who share their workout experiences and tips to encourage others. If you can become one of those influencers with your gym marketing, you can bring in new people like never before. One gym that does an outstanding job on Instagram is Anytime Fitness. From motivational phrases to staff images to group fitness classes, the team shares photos and graphics that are eye-catching and draw in its followers. Facebook invites a bit more interactivity between a business, and it’s customers thanks to the ease of sharing content. Posts where a customer tags your gym are easy to pass along and share to make your customers feel special and heard. Facebook is also great because you can post your special events on the platform and people who mark themselves as going will have the event appear for friends to see in their newsfeed. One gym that uses a nice mix of content is Gold’s Gym. This is a larger gym chain so it might be difficult to implement all that they do at your local gym, but it's an excellent place to learn. Some posts are centered on getting across stats and figures on why you should work out while others highlight blog posts and helpful workout tips. You'll also see their members working out. Along the left of their page “Find Your Gym” is one of the options available. From here, you can input your information to see where the closest gym to you is. You can also easily find another Gold’s Gym if you’re not from the area. Snapchat is a platform where you can send and share videos and photos with people or post them to your story for all of your friends to see. It’s an extremely popular social media option, but one that doesn’t have as much organic promotional opportunity as Facebook and Instagram do. One of the best ways to use Snapchat as a gym is to create a custom filter. When customers visit your gym, they can post photos and videos with your filter on it so that their friends have greater awareness about your facility and can attend as well, if they’re interested. Uploading a custom filter is inexpensive and a one-time cost. Your staff will also enjoy the option to use a custom filter on their photos and videos. When you post something to Pinterest, your goal is to get it pinned to other boards so that you can build greater and greater awareness for it. Content that works well on Pinterest for gyms is motivational phrase graphics that you create and links to blog articles on your website. Orange Theory Fitness does a great job on Pinterest. From inspiring sayings to why their workouts are good for you, the gym chain is excellent at its marketing on Pinterest. The Pinterest boards they have include what to do as a first-timer, motivation, and fitness tips. The fear of what might happen if you open your business up for reviews can keep some businesses from making that an option. So they don't list their business on Google My Business, and they close reviews on Facebook. But the reality is, people will talk about your gym and their experience there regardless. If you monitor the conversation and respond, it gives you the chance to do some reputation management in a way you couldn't if you weren't part of the conversation. You should read and respond to each review that you feel needs a response. Reviews that just say five stars and its good probably don't need much. Reviews that talk about how much the customer loves your facility should get a response so that they continue to share the word about your facility and feel heard as they give you praise. Negative reviews seem scary, but rest assured, they aren’t the end of the world. In fact, they’re just a tiny part of the journey in your online presence. Respond to the reviews without seeming defenseless and show that you genuinely care about the experience your customers have at your facility. This can help future visitors to know that you're there for your customers. Customer: Signed up for a one-year plan. Tried to follow the routine that the fitness trainer set for me. In the 12 minute room when you are supposed to start from the first piece of equipment and make your way around to the 12th (1 minute a piece) people come in and use random equipment when it clearly states on the wall not to. I am not a tattle tale, so I just ignored it, but greatly hindered my plan. Owner response: Our clubs strive to deliver a professional, customer service driven experience at all times and never want to hear that anyone is feeling this way. Club management will want to hear from you, and we encourage you to connect with them directly to share your experience. They will value the opportunity to address any concerns you may have. Notice how it isn’t trying to discount how the person feels or the experience they had. It also encourages the author to talk directly with the staff so that they can remedy the situation. That is good reputation management. In the case that you receive a negative review that’s actually about another business or a review that uses profanity, threats or is targeted at destroying your business, you can get these removed. The best option for negative reviews though is to respond to them instead of just having them removed. Print marketing can be an excellent way to get the word out about your gym, especially if it's new. Print marketing has a cost associated with it though, whereas online marketing is more organic and doesn't have printing costs. Each type of print marketing has its strengths though, so here's how to use each print type to the fullest. Hosting an event at your club and want to spread the word? Postcards can help you do just that and reach customers within a certain geographic location of your gym. This mailing type is nice because it costs less to mail since postage isn’t as expensive and is more eye-catching because your message is not hidden behind an envelope. Postcards can also be a nice way of reconnecting with people who haven’t visited your club in some time. Send a little note to remind them of the great things happening at your gym and invite them back. Mailers can serve as a great follow up to potential customers who visited your gym for an event or used a guest pass to test it out. Mailers can be fancy and attractive with popups or unique shapes and designs that capture the attention of the reader. The fancier you get with mailers though the more expensive they are. Use these types of mailings sparingly to ensure you see the financial benefit of them. Keep these for what you consider “hot leads” as far as potential for being new members. Fliers are nice because they aren’t as expensive to design and printing is not nearly as expensive. Have a designer create a standard template for you that you can adjust according to the event you’re using it for. You can hang fliers in local coffee shops or hand them out at 5Ks or parades. They’re easy to have printed at your local print shop or even locally in your office. On search engines and social media, you can use pay per click advertising. You select a geographic location to show your ad within and topics of interest or keywords to display the ad within, and the platform will charge you when someone clicks the ad. Pay per click advertising is a popular way to show up in the top results on a search engine if you aren’t organically on the first page yet. You can also use banner or display ads to capture the attention of your audience when they’re visiting websites related to fitness. Pay per click advertising is the new way to advertise to just the people you care about reaching. On Google, that’s based on the keywords they search and on social media it’s based on the pages they follow and topics they post about. If you’re driving traffic to your website, you need to have a strong strategy for how to get inquiries from there. Make it easy to get in touch with your gym so that visitors from online advertisements can reach out and learn more. You can also use a call extension on Google ads, but be sure that the phones are well monitored before using this option. Your website is the hub for your online presence, which means it should be both attractive and functional. A mobile app can make it simple and easy to see when your gym is open, what time classes are and read workout tips from your blog or social media newsfeed. We’ll take a look at some of the best websites and mobile apps and discuss what makes them so great. Pilsen's Fitness Center touts its differentiators on the homepage of its website. The five tiles below the banner image are cardio training, women's fitness, personal training, on-site childcare, and group fitness classes. In addition to providing everything a visitor needs to know to make a gym selection, the website also does well for security, SEO and load time. There is a clear contact form on every page so that you never have to search for the next step in your gym membership search. The site lists out its fitness classes and the schedule for them on a convenient calendar view. The amenities section has something for everyone, from a silver sneakers program to a childcare program. Prevail Boxing has a modern looking website. With an image of a woman doing a boxing workout as the prime image on the page, the site shows the power and exhilaration of a boxing workout. Head over to the workouts page, and you can learn more about the many classes and styles available at the gym from beginner to advanced. Here, you can also meet the trainers you'll be working with. This makes them feel friendly and approachable. The website also features an e-commerce platform where you can purchase apparel and equipment. This strength and conditioning gym is designed to help build strength and burn tons of calories during each workout. The site uses graphics and color to gain interest and engagement. The homepage features an attractive header graphic with buttons to sign up or view the class schedule. Below the header, you'll find tiles with information on pricing, the exercise method, and the class schedule, all commonly used pieces of information when selecting a workout regimen such as this. 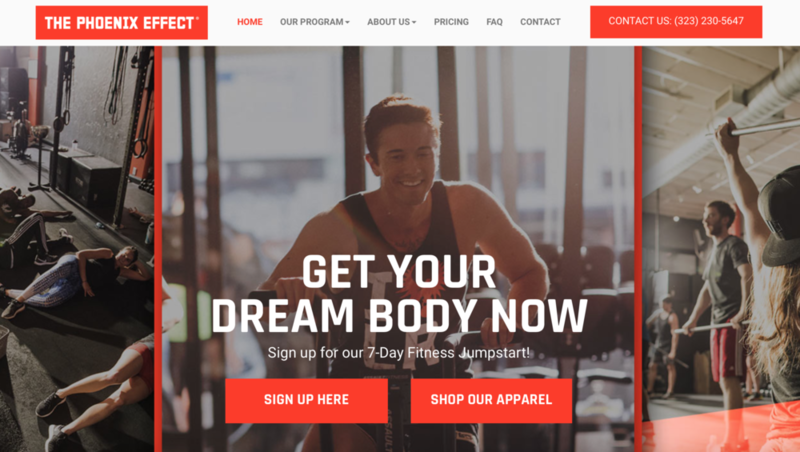 The gym also has an e-commerce site where you can purchase apparel to show your commitment to and passion for the exercise lifestyle. LA Fitness has an app that allows you to find a club, view class schedules, check in on social media, view club photos, and see promotions and information. The app also allows you to purchase gift cards and learn more about LA Fitness. Planet Fitness offers information on workouts, social media, motivational stories in video form that they call “planet triumphs,” the ability to record a workout so you can keep track of where you’re at, and workout ideas. For those yet to become members, the app also has membership information so you can become a customer. Crunch Fitness features their classes at the top of the app so you can learn more about their offering. You can also review your check-in history, so you know how often you're working out. Record a workout or learn more about nutrition from the helpful blog. Technology has enabled us to make each customer feel like our only customer with personalization and insights. If used correctly, technology can help you retain customers and showcase what makes you unique when prospects look to choose you. Here’s a look at what technology you might want to invest in. HubSpot integrates with your website forms so that the minute someone completes a form, they become an identified visitor on your website, and you can drop them into an email journey based on their interests. The platform is a fully functional CRM so that you can track where a customer is at in the funnel and then move them over to a customer list once they convert. You can publish directly to your blog and social media from HubSpot, making it a great all-in-one tool for managing your marketing needs. Active Campaign is a CRM and marketing automation tool. In addition to housing all that you know about a prospect or customer, you can also set them up to receive emails or a series of emails based off of what you know about them. New inquiries can automatically go into an email drip campaign that sends helpful information to them to help them choose a gym or retain them as a customer. Infusionsoft gives you insights into what a prospect is viewing on your website so you can execute marketing campaigns accordingly. If you have an e-commerce side to your website, Infusionsoft can help you track how you're doing and provide insights into what you're doing well and what you need to improve on to grow your business. But the capabilities don’t stop at digital marketing. You can also print mailing labels or envelopes for mailings from the system since it’s a CRM. ClubExpress provides a platform for you to manage your members, contracts, attendance, event, and employee management, billing and invoicing, reservations, and check-in. Accept credit cards or PayPal for recurring membership payments. Because it operates through a web browser, you can access it from anywhere or download an app for mobile devices. ZenPlanner allows you to take automated payments so you can stop invoicing your customers each month for their membership. Members can reserve a spot in your fitness classes using the member self-service portion of the software. If you’re looking for insights into what you need to do differently, you’ll love the reporting functionality. Additionally, ZenPlanner has an integrated website option so that you can manage your e-commerce inventory. The software simplifies your everyday work so you can improve efficiencies and focus on helping your customers reach their goals. If you’re looking for an app for your customers in addition to gym management, Wellnessliving can help with that. With a customer app and gym membership functionality, Wellnessliving can help you go to the next level with your gym. Additionally, the software integrates with Google to enable customers to book a class or appointment with you directly from the search engine or Google Maps. You can send reminder text messages to your customers to inform of class changes or cancelations. Build your online store to add additional income to your business with the e-commerce functionality Wellnessliving offers.